Ted West Woodworking - Goosebay Sawmill and Lumber, Inc.
Ted West runs a woodworking shop out of Canterbury NH. We use Ted for some of our millwork because we never doubt the quality of his craftsmanship. 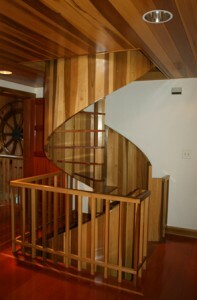 One look at his work and you’ll know why he is highly regarded as one of the top woodworkers in the area. His knowledge and passion for woodworking make him very easy to work with. We are very fortunate to have him as one of our contacts. 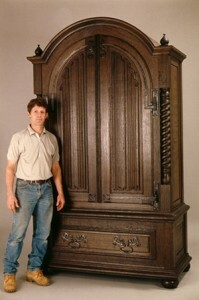 If you are looking for a master craftsman then check out his website twestwoodworking.com and see for yourself. There will also be contact info if you are interested in talking to him about a project that you have in mind. If you are interested in picking out your own lumber for a project, you are more than welcome to come into Goosebay and do so. Sometimes we are able to come across some rare finds. In the picture to left, you’ll see some Russian Black Oak that was found in a Russian peet bog after sitting more than 1500 years. Ted turned it into a beautiful armoire.